I had to take a sick day today as I was on day 4 of having a cold and fever. But I made the best of it by doing a sweet tutorial by Danielle Donaldson between naps. I'm pretty much in love with this little spotted bunny. Aw, I hope you're feeling better very soon, Kali! 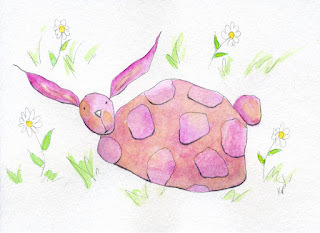 In the meantime, it seems this sweet bunny has brightened your day! I'm in love with him, too.